Gorgeous frameless shower door, I had to return it because of the door swung to the toilet seat, which is why I rate this 4 stars. 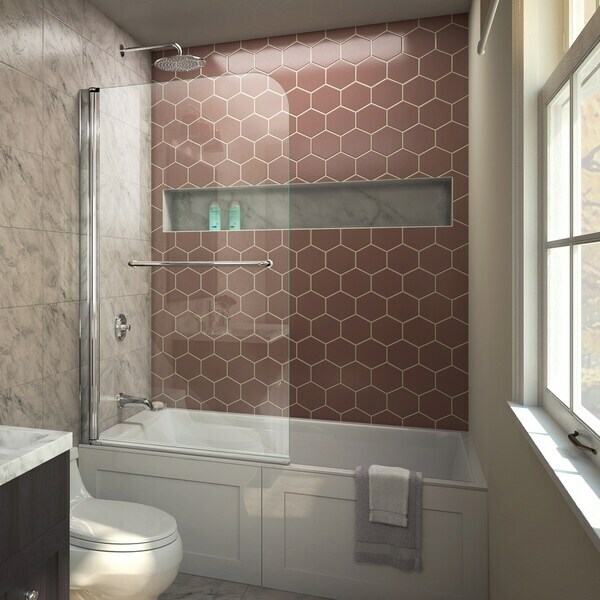 The DreamLine Aqua Swing is a frameless pivot tub screen door with a contemporary European flair to enhance the appearance of your bathroom. The design offers a clean, elegant and open look to complement your decor. Clean lines and a continuous hinge of the Aqua Swing add style and create an open, inviting shower space. Choose DreamLine for the ultimate solution for your shower project! Dimensions 1.0 In. X 34.0 In. X 58.0 In. We purchased this door for our new bathroom. No complaints. It leaves our bathroom feeling open and the door swings both ways. We love this door and would order again for second bathroom. It can swing right or left. I love this shower door. It has a towel rail and looks great in our recently remodeled guest bathroom. Popular in Europe, the half door not only does the job but it opens up the bathroom and makes it more airy. 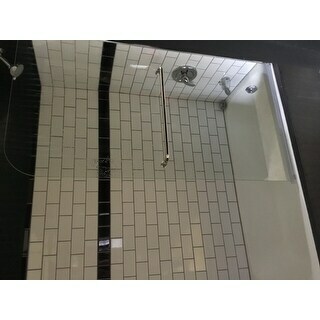 Much nicer than a shower curtain or conventional full glass tub enclosure with sliding doors and definitely easier to keep clean. If you are concerned about over spray, a bi fold or longer door might be a consideration, but we have had no problem at all. Easy to install and looks really great. Solid piece of glass and does not look cheap. The saloon type door open and closes both ways is a plus. Arrived in perfect condition. Fits the tub correctly. Had it professionally installed, no leakage, looks great. No complaints. Great tub door, looked a several other models—mainly the two-door type—and ultimately decided on this one due to the low cost and good reviews. It's also for a 2nd bath so just needed something stylish for occasional use. It was much easier to install that I thought it would be and managed to do it by myself in about an hour. Nice quality and clean lines. Highly recommended. Easy installation. Very nice looking quality product. Very happy with the purchase. We bought it for our son’s bathroom shower and looks great, being a half door gives the bathroom an spacious feeling. It came well packaged and my husband installed it by him self. Great price, easy installation and really opens up my bathroom. I love it! A relative easy D.I.Y. installation that gives bathroom bright, spacious and modern look. I bought this glass door for a renovation project. I do understand the open part of the tub would get water splatter out. However the side (hinges) tub door leaks when showering. This defeats the purpose of installing the door to prevent water leakages. "When it swings away, is there a track or anything left at the tub line? Or is it sealed by a gasket of some sort that is attached to the swinging door part?" There is an aluminum threshold that is sealed to the tub edge to deter water back in the tub. There is also a vinyl strip that is installed to the bottom of the glass door. "Does this door pivot into the shower as well as out?" This door pivots in and out. "Are there any videos on how to install?" I’m sorry but there are no installation videos at the time. Thank you for considering Dreamline and for shopping Overstock. "Does this come in a brushed nickel finish? " Unfortunately, the Aqua Swing Tub door does not come in brushed nickel at this time. The DreamLine Aqua Uno Tub Door, Overstock Item #14298917 has the brushed nickel finish. Thank you for shopping Overstock!